A new book by M.I.T and Harvard Medical School trained Neuroscientist and Clinical Audiologist Dr. Keith N. Darrow – one of the top specialists in his field who continues to reach great heights of quality health care and treatment in audiology — a brilliantly informative and profoundly practical book about hearing loss which reveals Dr. Darrow’s innovative approach to medically treating the cognitive aspects of hearing loss for individuals of all ages. Stop Living in Isolation is set to be a game changer as those affected by hearing loss learn the correlation between it and the mind-robbing diseases of dementia, depression, social isolation and a sedentary lifestyle. Dr. Darrow, between his numerous years of continuing education, practice in his field and research, is determined to reveal the science to maintaining independence and increasing social engagement by bettering your hearing. His passion, training and determination have led him to teach you about the proven benefits of NeuroTechnology. 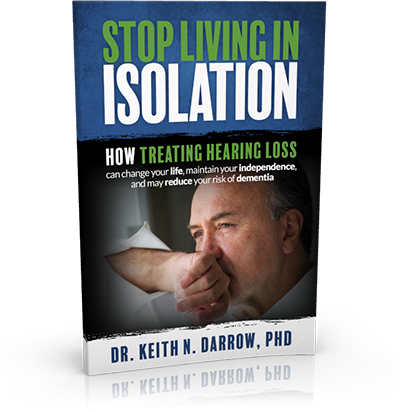 In this groundbreaking book, Dr. Keith N. Darrow documents ways to reduce the risks of developing dementia and exposes the devastating impacts of hearing loss if left unchecked. He presents a comprehensive, step-by-step guide to better hearing, increasing cognitive function, increasing socialization and maximizing your quality of life. Dr. Darrow offers the value behind NeuroTechnology, which is at the heart of a more comfortable, healthier way of living with the daily challenges of aging and hearing loss. And, he challenges some common myths about aging and dementia in correlation to hearing loss. This book is packed with information for those who want to learn how to live a better, more active, more engaged lifestyle regardless of age. Hearing is what connects us to others. It is the building block to communication in our personal and professional lives. You and your loved ones can break free from the stresses of hearing loss and avoid the unnecessary consequences of leaving it untreated. As science is helping us to live longer lives, we need to be best prepared for the challenges that hearing loss and dementia can have on our golden years. Using Dr. Darrow’s information and proven methods, you can once again achieve peak performance in your life. Stop Living in Isolation is the only book you will ever need to learn all you need to know about this subject. Fortunately for me, I have read this book just in time. I have started being “isolated” lately and have learned so much about the effects hearing loss can have on us. Along with proper nutrition, hearing devices, and some brain games, my cognitive abilities have improved dramatically. This book gives the best information possible for people who want to restore hearing and clarity to their life. You DO NOT have to struggle your way through the remaining years of your life! Find yourself an Audiologist who cares about you as a person, and that can help you restore YOUR life. Dr. Darrow thank you for the information and I look forward to your future research and work.